A small business’ website is a crucial to get right. It represents your company and its image, and can be your best salesperson. To make your website all it can be we have created a checklist. Going through this list will help prepare you for the design and content creation aspects of your site. Content – The leading cause of delay in the web design process is the creation of content. We believe that the less words you can use the better, so content should be precise and help you get your message out. Be clear and try to think of your audience, try using terms that your audience would use instead of industry specific terms. Remember that most people viewing your site will be quickly skimming through areas of text. Finally, think of the goal of your site. What do you want them to do next? For example, end your paragraph with another potential page to view or with instructions of how they can contact you. Email – Email is a very important aspect of your site and in many cases customers will feel more comfortable emailing you rather than calling. So an important aspect of preparing for a website is to think of what you are going to do with the company emails. The two biggest factors in choosing an email plan is the amount of email accounts and the amount of space needed for each of those account. With Gordon Multimedia you are free to use any email client you currently do, however we offer premier email accounts that boasts several benefits, including being hosted on one of the leading server companies, and including superior spam filtering and protection for all of our accounts. When it comes to emails you have two choices. 1 GB account – These accounts are included with any hosted package (number of include email accounts depends on hosting plan) and are provided at no additional monthly charge. These are a basic account that gives you all the email features you would expect such as aliases, auto reply and spam filters. This plan is best when you are need of many accounts that are well maintained, meaning that emails in the inbox are being deleted or archived to a local machine. 25 GB account – These accounts are for those who don’t want to have to worry about memory limits. It allows you to save many more emails on the server, which can be a great way of storing conversations with customers to make finding information as simple as a search of your email. These accounts come at an additional charge of $3 per account/ per month. Many times our customers do a combination of both types of email to give the lar ger email accounts the additional space. Your Audience – Something to keep in mind throughout the entire website creation process is your audience. What type of things does your audience expect to see? What colors or logos or brand names do they associate with your services? 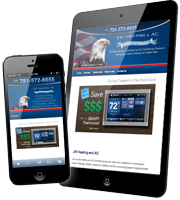 Another thing to consider is a responsive design. Especially with younger audiences mobile viewing is only on the rise so it is important that your site looks just as good on a mobile device as it does on a larger screen. Many times if someone views a site on a device that is broken or hard to view on a mobile phone they will simply hit the back button. 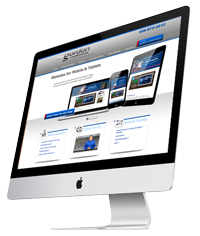 Gordon Multimedia’s responsive design add-on will allow you to maintain just one site but have the benefits of two: a mobile and a desktop version.